2006-02-22 Application filed by Rothmans, Benson & Hedges Inc. filed Critical Rothmans, Benson & Hedges Inc. The invention relates to a cigarette for reducing a ratio of at least one constituent to tar in mainstream smoke. The cigarette comprises at least one of a low efficiency tobacco smoke filter and a tobacco blend having a lower stem content as compared to a conventional tobacco. FIELD OF THE INVENTION This invention relates to altering mainstream smoke, in particular, to selectively altering mainstream smoke using a tobacco smoke filter and/or a tobacco blend. BACKGROUND OF THE INVENTION The ratio of the weight of carbon monoxide to the weight of tar delivered in the mainstream smoke of cigarettes is usually unity or more, although in some cases the ratio is as low as 0.9. By "tar" is meant particulate material measured on a water and nicotine-free basis. Improved tobacco smoke filters have been developed to reduce the ratio of carbon monoxide to tar. For example, British Patent Application 2,113,066 is directed to a ventilated tobacco smoke filter having a ventilating tipping overwrap and a filtering material that forms a layer around a dense fibrous or filamentary core. The filter lowers carbon monoxide preferentially with respect to tar. British Patent Application 2,160,084 is directed to reducing the ratio of carbon monoxide to tar for a sidestream smoke-inhibited cigarette. The tobacco smoke filter has a centre portion that is sealed off, which directs the smoke entering the filter from the tobacco rod to the ventilated periphery of the filter, to reduce the ratio of carbon monoxide to tar. To further reduce the ratio of carbon monoxide to tar, the cigarette incorporates a tobacco blend, wherein conventional stem is replaced with shredded enhanced stem. In one aspect, there is provided a cigarette for reducing a ratio of at least one constituent to tar in mainstream smoke, the cigarette comprising at least one of a low efficiency tobacco smoke filter and a tobacco blend having a lower stem content as compared to conventional tobacco. For example, the cigarette can reduce the ratio of at least one constituent to tar in mainstream smoke such as, and without being limited thereto, carbon monoxide and constituents from the group of carbonyls (e.g. formaldehyde, acetaldehyde, acetone, acrolein, propionaldehyde, crotonaldehyde, methyl ethyl ketone (MEK), and butyraldehyde). In another aspect, the cigarette is at least one of a sidestream smoke treatment cigarette and is a low ignition propensity cigarette having at least one of a low efficiency tobacco smoke filter and a tobacco blend having a lower stem content as compared to conventional tobacco. The term "tobacco blend" encompasses any tobacco composition(s)/ tobacco blend(s) used in cigarettes. The term "conventional tobacco" encompasses any tobacco composition(s)/ tobacco blend(s) normally used in smokable cigarettes. In another aspect, there is provided a cigarette for reducing a ratio of at least one constituent to tar in mainstream smoke, the cigarette comprising a tobacco rod, a treatment wrapper/paper and a low efficiency tobacco smoke filter, the treatment wrapper/paper comprising a sidestream smoke treatment composition, wherein the treatment composition comprises in combination, an oxygen storage and donor metal oxide oxidation catalyst and an essentially non-combustible finely divided porous particulate adjunct for the catalyst. In yet another aspect, there is provided a cigarette for reducing a ratio of at least one constituent to tar in mainstream smoke, the cigarette comprising a synergistic combination of a low efficiency tobacco smoke filter and a tobacco blend having a lower stem content as compared to conventional tobacco. In yet another aspect, the low efficiency tobacco smoke filter is a tobacco smoke coaxial core filter. In another aspect, a cigarette for reducing a ratio of at least one constituent to tar in mainstream smoke, the cigarette comprising at least one of a low efficiency tobacco smoke filter and a tobacco blend having a lower stem content as compared to a conventional tobacco, in combination with at least one of a cigarette wrapper/paper, tobacco additive and tobacco smoke filter additive. In another aspect, there is provided a method for reducing a ratio of at least one constituent to tar in mainstream smoke from a burning cigarette comprising using a cigarette comprising at least one of a low efficiency tobacco smoke filter and a tobacco blend having a lower stem content as compared to a conventional tobacco, wherein the cigarette is a sidestream smoke treatment cigarette and/or a low ignition propensity cigarette. In another aspect, there is provided a method for reducing a ratio of at least one constituent to tar in mainstream smoke from a burning cigarette comprising a step of using a cigarette comprising a synergistic combination of a low efficiency tobacco smoke filter and a tobacco blend having a lower stem content as compared to a conventional tobacco. For ease of description, whenever the term cigarette is used, it is understood not only to include smokable cigarettes but any form of wrapped smokable product, such as cigars or the like. Whenever the term cigarette paper/wrapper is used, it is understood to encompass combustible and non- combustible papers and the like which may be used on cigarettes, cigars and the like. The paper/wrapper may be used as a single layer of cigarette paper or multiple layers of cigarette paper. The paper/wrapper may be applied as the sole layer of cigarette paper or as a wrap over conventional cigarette paper of a cigarette. With regards to a conventional cigarette, it has been found that a synergistic combination of a low efficiency tobacco smoke filter and a tobacco blend having a lower stem content as compared to conventional tobacco can reduce the ratio of at least one constituent to tar in mainstream smoke. With regards to a sidestream smoke treatment cigarette and/or low ignition propensity cigarette, it has been found that such a cigarette in combination with a low efficiency tobacco smoke filter, a tobacco blend having a lower stem content as compared to conventional tobacco, or both can reduce the ratio of at least one constituent to tar in mainstream smoke. The term "mainstream" smoke refers to the mixture of gases and particulates passing down the tobacco rod and issuing through the filter end, i.e. the amount of smoke issuing or drawn from the mouth end of a lit cigarette during smoking of the cigarette. The term "sidestream" smoke refers to the mixture of gases and particulates given off from the end of a burning cigarette between puffs and is not directly inhaled by the smoker. Sidestream smoke is made up of visible components, as well as invisible gases. The term "sidestream smoke treatment" refers to reducing (e.g. lowering) visible sidestream smoke. This treatment encompasses any reduction in sidestream smoke. This can include, but not limited thereto, reduction by greater than about 50%, as much as about 80% and even greater than about 95% reduction of visible sidestream smoke. The term "low ignition propensity" cigarette refers to the free-burn rate control of a burning cigarette such that when the cigarette is set down it is capable of self-extinguishing for purposes of safety. The term "low efficiency" tobacco smoke filter refers to a tobacco smoke filter wherein less nicotine and/or tar is caught on the filter compared to a standard acetate tobacco smoke filter having a similar pressure drop. The low efficiency tobacco smoke filter and/or tobacco blend having a lower stem content as compared to conventional tobacco can reduce the ratio of at least one constituent to tar of mainstream smoke. Some of the constituents are as follows: carbonyls such as aldehydes and ketones, carbon monoxide, 1,3- butadiene, isoprene, acrolein, acrylonitrile, hydrogen cyanide, o-toluidine, 2- .
naphthylamine, nitrogen oxide, benzene, and N-nitrosonornicotine. More specifically, at least one of formaldehyde, acetaldehyde, acetone, acrolein, propionaldehyde, crotonaldehyde, methyl ethyl ketone (MEK), butyraldehyde, 1,3 -butadiene, isoprene, acrylonitrile, o-toluidine, benzene, and ammonia has been reduced. These constituents form part of the Hoffman analytes, which are recognized in the cigarette industry as describing a group of constituents in mainstream smoke. A complete listing of the Hoffman analytes is as follows: carbon monoxide; constituents from the group of phenols (e.g. catechol, phenol, hydroquinone, resorcinol, o-cresol, m+p-cresol); constituents from the group of carbonyls (e.g. formaldehyde, acetaldehyde, acetone, acrolein, propionaldehyde, crotonaldehyde, butyraldehyde, methyl ethyl ketone); ammonia; aromatic amines I (1-aminonaphthalene; 2- aminonaphthalene; 3- aminobiphenyl, 4-aminobiphenyl); aromatic amines II (o-toluidine, o-anisidine, aniline, m-toluidine); aza-arene; eugenol; hydrogen cyanide; metals I (nickel, cadmium, arsenic, lead, chromium, selenium); mercury; nitric oxide; nitrosamines (N-nitrosonornicotine, 4-(N-nitrosomethylamino)- 1 -(3-pyridyl)- 1 - butanone, N-nitrosoanatabine, N-nitrosoanabasine); PAHs (benzo[e]pyrene, naphthalene, fluorene, phenanthrene, fluoranthene, pyrene, benzo[a] anthracene, chrysene, benzo(a)pyrene, indeno[l,2,3-cd]pyrene); pyridine; quinoline; 3-vinylpyridine; 1,3 -butadiene, isoprene; acrylonitrile; benzene; toluene; and styrene. The ratio of at least one Hoffman analyte to tar is reduced using the tobacco smoke filter and/or tobacco blend having a lower stem content as compared to conventional tobacco. In one embodiment, a cigarette comprises a tobacco rod enclosed within a cigarette wrapper/paper and has a low efficiency tobacco smoke filter coupled to one end of the rod. The filter decreases the ratio of at least one constituent to tar in mainstream smoke. The cigarette, itself, may be a conventional cigarette, a sidestream smoke treatment cigarette, and/or a low ignition propensity cigarette. For example, and without being limited thereto, the cigarette wrapper/paper of the cigarette can be any suitable cigarette wrapper/paper such as, and without being limited thereto, a conventional cigarette wrapper/paper, a sidestream smoke treatment cigarette wrapper/paper, and/or a low ignition propensity cigarette wrapper/paper. The low efficiency tobacco smoke filter is constructed to reduce the ratio of at least one constituent to tar of mainstream smoke, more typically, carbon monoxide and carbonyls. In one embodiment, the low efficiency tobacco smoke filter is a coaxial core filter, such as that described in U.S. Patent 5,787,902, the subject matter of which is incorporated herein by reference. One example of the low efficiency tobacco smoke filter is a tobacco smoke coaxial core filter, wherein filtering material forms a layer around a less dense filtering material core. The filter is surrounded by a ventilated tipping paper. The tipping paper may be ventilated in a variety of ways, for example, the tipping paper may be electrostatically perforated (EP). In use, the ventilated tipping paper (e.g. of substantially impermeable paper having perforations therethrough) typically provides about 10% to 90% air dilution of the smoke, more typically about 35% to about 50%. The percentage air dilution as referred to herein is the percentage by volume of ventilating air added via the filter in the total mixture delivered by the filter; thus about 50% ventilation or air dilution means that in each puff there is about a 50/50 volume ratio of added air to original smoke, and about 40% air dilution indicates about a 40/60 ratio, and so on. The filter has the properties of a low efficiency tobacco smoke filter having a range of ventilation. The filtering material that forms the layer around the less dense filtering material core contributes to a high pressure drop. The less dense filtering material core has a low efficiency and, thus, a low pressure drop. The higher pressure drop filter layer counteracts the core to provide a suitable draw resistance for the smoker. The low efficiency tobacco smoke filter may also comprise adsorbents. For example, the filtering material core and/or layer, as described above, may also further comprise adsorbents such as, and not to be limited to, carbon and/or zeolites. Typically, the core contains the adsorbent. Mainstream smoke is diluted in the tobacco smoke filter by air ventilation. Some diffusion of the constituent(s) may take place through the perforations. Typically, the less dense core filtering material may be of conventional material of low filtering efficiency, for example, cellulose acetate tow or other fibre of about 8 dpf (denier per filament) or more (as filamentary tow or staple fibres) or gathered corrugated web material. The fibrous material layer is made of more dense material, for example, cellulose acetate tow less than about 8 dpf. The less dense core, radial flow of smoke or air between the core and the filtering material may be prevented by a wrap or sleeve (e.g. of non-porous paper or impermeable film) or integral skin around the core. The tobacco smoke filter may also include more than one core. For example, and without being limited thereto, there may be alternating adjacent cores, wherein one may contain an adsorbent and the other no adsorbent. The core is typically parallel to the filter axis and coaxial with the filter. The tobacco smoke filter according to the invention may of course be readily made, in one embodiment, by continuously advancing longitudinally a web or band of the smoke filtering material, continuously feeding thereonto a continuous core or depositing thereon at longitudinally spaced intervals lengths of core, continuously condensing the assembly into rod form with the filter material surrounding the core, continuously wrapping the rod form in the ventilated tipping paper, and continuously cutting the resulting continuously produced product into individual lengths. Filters may be used alone, or as a component of a multiple filter. The tobacco smoke filters of the invention may be designed for any desired length, core and surrounding filter materials, structure, packing density and relative cross-sectional areas etc., and of percentage air dilution, to provide with any given tobacco rod any acceptable predetermined overall ventilated filter cigarette pressure drop - e.g. about 80 to about 120 mm. Wg. (water gauge), typically about 80 or about 90 or about 100 mm. Wg. However, much higher or much lower ventilated filter cigarette pressure drops can be provided as current requirements dictate. Although the use of the low efficiency tobacco smoke filter provides a reduction in the ratio of at least one constituent to tar in mainstream smoke, further reduction may be achieved by altering the components of the tobacco blend in the cigarette. It has been found that blends having a lower stem content as compared to conventional tobacco, in combination with the low efficiency tobacco smoke filter, improves the reduction of the ratio of constituent(s) to tar in mainstream smoke. The amount of stem used may be, and without being limited thereto, from about 0 weight % to about 20 weight % of the total weight of the tobacco blend; typically from about 0 weight % to about 10 weight % of the total weight of the tobacco blend; and more typically, no stem. Without being limited by theory, it is speculated that the tobacco blends with less stem or without stem have a tighter packing than a conventional tobacco blend and, as such, creates an increased draw resistance. This type of blend in combination with the low efficiency tobacco smoke filter may create a synergy that is capable of reducing the ratio of at least one constituent to tar in mainstream smoke more so than that compared to a low efficiency tobacco smoke filter alone. Application 10/419,975; and other patents and patent applications such as International Patent Application WO 03/026808; U.S. Patent Application 2004123874, U.S. Patent 5,878,754, and U.S. Patent No. 6,779,530, the subject matter of which are all incorporated herein by reference. For example, U.S. Patent No. 6,779,530 is directed to a process for reducing the permeability of a cigarette paper/wrapper. The cigarette paper/wrapper is treated with a permeability reducing composition (e.g. alginate) to form treated discrete areas on the wrapper creating a permeability sufficient to reduce the ignition proclivity of the cigarette made with the paper/wrapper. For example, a sidestream smoke treatment cigarette, which is described in U.S. Patents 6,799,578 and 6,810,884, may be combined with the low efficiency tobacco smoke filter, such as the coaxial core filter, and/or tobacco blend having a lower stem content as compared to a conventional tobacco or conventional tobacco blend to treat mainstream smoke. The sidestream smoke treatment cigarette comprises a sidestream smoke treatment composition having an oxygen storage and donor metal oxide oxidation catalyst used in combination with a non-combustible finely divided porous particulate adjunct for the catalyst. It has been found that when these two components are used in combination either alone or with other constituents, sidestream smoke control is provided. This composition may be applied as a coating to or filler within the cigarette paper and the resultant sidestream smoke cigarette looks like a conventional cigarette. The adjunct may be any suitable essentially non-combustible, finely divided porous particulate material. The particulate material is physically stable at the elevated temperatures of the burning cigarette coal. The porous adjunct has a high surface area, usually in excess of about 20 m2/g of adjunct. Typically, the porous adjunct has pores with an average diameter of less than 100 nm (lOOOA). More typically, the pores have an average diameter of less than 20 nm (200 A) and even more typical are pores with an average diameter of 0.5 to 10 nm (5-100 A). With zeolite based materials, the pores have an average diameter in the range of about 0.5 to 1.3 nm (5-13 A). The particulate adjunct can have an average particle size of less than about 30μm, which includes nanoparticle sizes, typically less than about 20μm. Non-combustible materials may be porous clays of various categories commonly used in cigarette paper manufacture, such as the bentonite clays or treated clays having high surface areas. Non- combustible carbon materials may also be used including milled porous carbon fibres and particulates. Various metal oxides may be used such as porous monolithic mineral based materials which include zirconium oxide, titanium oxides, cerium oxides, aluminum oxides such as alumina, metal oxide fibres such as zirconium fibres and other ceramics such as milled porous ceramic fibres and mixtures thereof. In respect of cerium oxide, it has been found that it is capable of functioning as a finely divided adjunct and as an oxygen storage and donor cerium oxide oxidation catalyst. Other adjunct materials include high surface area materials such as activated carbon and zeolites. The adjunct may also comprise high surface area highly sorptive materials which are non-combustible, inorganic finely divided particulate, such as molecular sieves which include zeolites and amorphous materials such as silica/alumina (can be referred to aluminosilicates) and the like. The most typical are zeolites such as silicalite zeolites, faujasites X, Y and L zeolites, beta zeolites, Mordenite zeolites and ZSM zeolites. Typical zeolites include hydrophobic zeolites and mildly hydrophobic zeolites which have affinity for hydrophobic and mildly hydrophobic organic compounds of such sidestream smoke. The zeolite materials provide a highly porous structure which 5 selectively absorbs and adsorbs components of sidestream smoke. The highly porous structure generally comprise macropores amongst the particles and micropores within the particles which branch off of the macropores. It is believed that the captured components in the macropores and micropores in presence of the cerium oxide or other suitable oxidation catalysts at the high , 10 temperature of the burning cigarette, converts such captured components into oxidized compounds which continue to be trapped in the adsorbent material or are released as invisible gases which have sufficiently low tar and nicotine levels so that the sidestream is invisible or at a low desired level. 0.5 to 1.3 nm (5 to 13A). Typical zeolites of the above formula, have the specific formulas of faujasites ((Na2, Ca5 Mg)29[Al58Si134O384] • 240 H2O; cubic), β-zeolites (Nan[AlnSi64-I1O128] with n<7; tetragonal), Mordenite zeolites (Nag[Al8Si40O96] • 30 24 H2O; orthorhombic), ZSM zeolites (Nan[AlnSi96-11Oi92] ~ 16 H2O with n<27; orthorhombic), and mixtures thereof. The oxygen donor and oxygen storage metal oxide oxidation catalyst is most typically selected from the transition metal oxides, rare earth metal oxides, (such as scandium, yttrium, and lanthanide metal series, i.e. lanthanum) and mixtures thereof. It is appreciated that the catalyst may be in its metal oxide form or a precursor of the metal oxide which, at the temperature of the burning cigarette, is converted to a metal oxide to perform its catalytic activities. The transition metal oxides, in combination with rare earth metal oxides, may be selected from oxides of the group of metals from the Periodic Table consisting of groups IVB, VB, VIB, VIIB, VIII and IB metals and mixtures thereof. Typical metals from the transition metal group are oxides of iron, copper, silver, manganese, titanium, zirconium, vanadium and tungsten and from the rare earth group are oxides of lanthanide metals such as oxides of cerium. For example, cerium may be used in admixture with any one of the transition metals. It is appreciated that other metal oxide oxidation catalysts may be used with the oxygen storage and oxygen donor type of catalyst. Such other metal catalysts include precious metals and metals from groups HA, IVA and mixtures thereof. Examples include tin, platinum, palladium and mixtures thereof. The cerium catalyst precursor may be in the form of a cerium salt such as a cerium nitrate or other dispersible forms of cerium which are applied in solution or sol to the sorptive material and which is converted to cerium oxide at the high temperature of the burning cigarette to then function as a catalyst. The term "catalyst" is intended to include any catalyst precursor. The catalyst such as, cerium oxide, is used in combination with the adjunct material. It has been found that when the two are used separate from one another or in spaced apart, non-adjacent layers, the ability to control sidestream smoke is greatly reduced. Although in certain arrangements, some sidestream smoke control can be achieved. Typically the catalyst is substantially adjacent the adjunct material. This can be achieved by co- mingling the particulate catalyst, in admixture with the adjunct, contacting a layer of the adjunct with a catalyst layer, coating the catalyst on the adjunct (in this case, the adjunct clearly acts as a support) or impregnating the catalyst within or on the porous surfaces of the adjunct, to bring about sidestream smoke control properties. It should be appreciated that many other constituents may be used in addition to the combination of the oxygen storage and oxygen donor metal oxide oxidation catalyst and the adjunct. Additional additives may be used to further enhance the altering the sidestream smoke or alter other characteristics of the cigarette. Such additional additives may be mixed in with the treatment composition or used elsewhere in the cigarette construction. The composition may be formulated in a variety of ways which achieve co-mingling of the cerium with the adsorptive material. For example, the adsorptive material may be sprayed with or dipped in a cerium salt solution such as cerium nitrate or cerium sol to impregnate the surface of the adsorptive material with cerium. Cerium oxide may be prepared as a separate fine powder which is mixed with the fine powder of the adsorptive material. It is typical that the catalyst powders have an average particle size of less than about 30μm, less than 20μm and/or nanoparticle sizes. Nanoparticles are meant to include particles that have an average particle size of less than a micron. An average particle size may be less than about 500 nm, less than about 100 nm, less than about 50 nm, and less than about 5 nm. As a general guide to selecting catalyst particle size and surface area, it is appreciated by one skilled in the art that the selected catalyst has a surface area which is such to ensure that the catalyst action sites are available to the migrating sidestream smoke components. This may result in catalyst particle size being greater than 30μm in certain embodiments, if the catalyst particles are properly distributed to achieve the necessary degree of sidestream smoke component oxidation. However, nanoparticle sizes can also result. Cerium oxide is one of the few metal oxides which can perform both functions, namely as the oxygen storage and oxygen donor catalyst and as well as the adjunct. The cerium oxide is used with the cigarette paper in a first amount as the catalyst and a second amount as the adjunct in the treatment composition. Such amounts of the cerium oxide correspond generally with the amounts used for the catalyst and adjunct to make up the total loading. The particles sizes can be any suitable particle sizes ranging from nanoparticle sizes to microns. The cerium may be formulated as a solution dispersion, such as cerium oxide sol, or the like and applied to the sorptive material such as zeolite. It is then dried and fired to provide cerium oxide particles fixed on the surfaces of the adsorptive material. When the cerium oxide particles are fixed to adjunct surfaces such as surfaces of zeolite, the average particle size may be less than about l.Oμm. The relative amounts of cerium oxide fixed to the zeolite may range from about 1% to 75% by weight based on the total equivalent cerium oxide and zeolite content. The typical relative amounts of cerium oxide fixed to the zeolite may range from about 10% to 70% by weight based on the total equivalent cerium oxide and zeolite content. A typical method for making the combination product of cerium oxide fixed on the surfaces of the zeolite is described in a co-pending application, U.S. Patent Application 20030114298, entitled A Process For Making Metal Oxide-Coated Microporous Materials, filed in the U.S. Patent Office on September 13, 2002, the subject matter of which is incorporated herein by reference. Although a detailed specification for the manufacture of the combination product is provided in the above application, for ease of reference, the method generally involves making a catalytic cerium oxide-coated zeolite particulate material having at least 1% by weight of cerium oxide coated on outer surfaces of the zeolite particulate material, based on the total equivalent cerium oxide and zeolite content. In one aspect, the method generally comprises the steps of: i) combining an amount of a colloidal dispersion of cerium oxide hydrate with a compatible zeolite particulate material to form a slurry, the amount of the colloidal dispersion being sufficient to provide, when heat treated as per step (ii), greater than 20% by weight of the cerium oxide, the zeolite particulate material having an average pore size of less than 2θA and the colloidal dispersion having an average particle size of at least 2θA, to position thereby, the colloidal dispersion on the outer surfaces of the zeolite; and ii) heat treating the slurry firstly, at temperatures below about 2000C and secondly, above about 4000C, to fix the resultant cerium oxide on the outer surfaces of the zeolite particulate material, to provide a free flowing bulk particulate. The cerium oxide on the surfaces of the zeolite may range in average particle size of less than about 30μm down to nanoparticle sizes. The nanoparticle sizes can range from an average particle size of less than about 500 nm down to less than about 5 nm. Other size ranges may include an average particle size of less than about 20μm or less than about 100 nm or less than about 50 nm. This product is available from AMR Technologies, Inc. of Toronto, Canada. Alternatively to this method, the adjunct sorptive material may be dipped in a solution of cerium salt and dried and heat treated to form the cerium oxide on the surfaces of the sorptive material. The activity of the sidestream smoke treatment composition permits its use in cigarette papers having a wide range of porosities. It has also been found that the composition does not have to be used in cigarette papers that just have high porosities. The treatment composition works equally well in papers with very low porosities of about 0.5 through to very high porosity of about 1,000 Coresta units. Typical porosities are usually less than 200 Coresta units and most typical porosities are usually in the range of about 30 to 60 Coresta units. It is appreciated that the paper may be used as a double or multiple wrap. The paper may be applied as an outer wrap over a cigarette having conventional cigarette paper. It is appreciated that depending upon the porosity, certain combinations of the catalyst and adjunct may work better than others. Desirable loadings of the treatment composition onto or into the cigarette paper, wrapper or the like is typically in the range of from about 2.5 g/m to about 125 g/m . Most typically the loading is in the range of about 2.5g/m2 to about 100 g/m2. Expressed as a percent by weight, the paper may have from about 10% to 500% by weight and most typically about 10% to 400% by weight of the treatment composition. While these loadings are representative for single paper, it is understood by one skilled in the art that these total loadings may be provided with the use of two or more papers. The sidestream smoke reduction composition is used normally as a water slurry of the composition. The slurry may be incorporated in the furnish of the paper in the paper making process, or is coated onto the paper by various coating processes or impregnated into the paper by various impregnating methods. In a specific embodiment, a sidestream smoke cigarette comprises a low efficiency tobacco smoke filter, such as the coaxial core filter and/or tobacco blend having a lower stem content as compared to conventional tobacco, and a treatment paper having a sidestream smoke treatment composition. The treatment composition comprises in combination, an oxygen storage and donor metal oxide oxidation catalyst and an essentially non-combustible finely divided porous particulate adjunct for the catalyst. Typically, oxygen storage and donor metal oxide oxidation catalyst is ceria and the adjunct is a zeolite. The catalyst, as mentioned above, can be any suitable particle size, including nanoparticles, and the catalyst can be on or within the adjunct. 2003131859, 2003075193, 2003075193, the subject matter of which are incorporated herein by reference. Such wrapper/paper, tobacco and tobacco smoke filters include additives such as, and without being limited thereto, metal oxide(s), metal oxide(s) in combination with adjunct(s) (e.g. support, aluminosilcates etc. ), which can include coating the metal oxide on the adjunct and/or impregnating the catalyst within or on the porous surfaces of the adjunct. Any suitable sized particles can be used, such as nanoparticle sized additives which may also be capable of reducing amounts of at least one constituent from mainstream and/or sidestream tobacco smoke. Such nanoparticle additives may also be included in the low efficiency tobacco smoke filter and/or tobacco blend having a lower stem content as compared to conventional tobacco. The above disclosure generally describes the invention. A more complete understanding can be obtained by reference to the following specific Examples. These Examples are described solely for purposes of illustration and are not intended to limit the scope of the invention. Changes in form and substitution of equivalents are contemplated as circumstances may suggest or render expedient. Although specific terms have been employed herein, such terms are intended in a descriptive sense and not for purposes of limitation. AU of the cigarette samples described in these examples have a similar total length, rod length, diameter, and rod density. Virginia-type flue cured tobacco blend having 8% expanded tobacco, 17% stem and 75% lamina; 29 Coresta citrate paper; and a standard acetate tobacco smoke filter (2.4/34). The cigarette was manufactured using a standard cigarette making machine, as known to one skilled in the art. 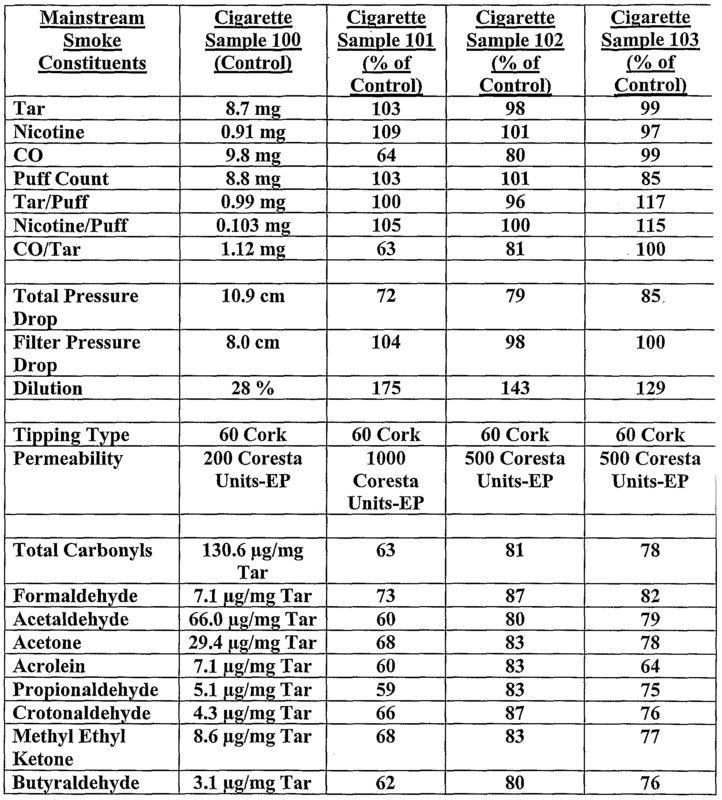 Cigarette sample 101 was a cigarette comprising 100% lamina flue cured lamina; 51 Coresta citrate paper; and a low efficiency tobacco smoke coaxial filter (specifications shown in Table 1 below). The cigarette was manufactured using a standard cigarette making machine, as known to one skilled in the art. Cigarette sample 103 was prepared using a single-incorporated paper/wrapper. The paper/wrapper has about 40 g/m2 basis weight with approximately 43% sidestream smoke treatment composition (e.g. 29 g/m2). The remainder of the basis weight was flax. The treatment composition was prepared using about 44% ceria from ceria sol (from AMR Technologies, Inc. of Toronto, Canada) / 56% Y-type zeolite CBV 720 (from Zeolyst International of Valley Forge, Pennsylvania, U.S.A..), the method for making this particular treatment composition is described in co-pending application, U.S. Serial No. 10/242,675, entitled A Process For Making Metal Oxide-Coated Microporous Materials, filed in the U.S. Patent Office on September 13, 2002, the subject matter of which is incorporated herein by reference. For example, cerium carbonate (50 g, 99.9% purity) containing 69.3% by weight cerium oxide equivalent was slurried with distilled water (0.1 L) and dissolved by adding nitric acid (38.4 ml; 16 M). The resulting neutral solution was boiled for a few minutes, filtered to remove traces of insoluble matter, and diluted to 1 L with water to give a cerous nitrate solution. A mixture comprising ammonium hydroxide (40 ml, 18 M), hydrogen peroxide (20 ml, "100 volume") and water (160 ml) was added with stirring to the cerous nitrate solution prepared and maintained at 750C. The resulting insoluble, dark brown cerium (IV) peroxide complex rapidly faded in colour and after the complete addition of the ammonium hydroxide/hydrogen peroxide mixture, a creamy- white precipitate of cerium (IV) hydroxide was obtained, having a pH of 7.0. The precipitate was centrifuged and washed twice by stirring with successive 1 L volumes of distilled water. The separated precipitate was stirred with distilled water (750 ml) and nitric acid (12.5 ml of 16 M) to give a nitric acid/ cerium oxide mole ratio of 1. The resulting slurry was heated to about 7O0C for 15 minutes to deaggregate the cerium (IV) hydroxide and give a conditioned slurry. The pH of the conditioned slurry was less than 1. After cooling, the slurry was centrifuged and the residue was collected. Using a scaled-up method of the above, 1.22 kg of the residue (a dispersible ceria gel) was made and stirred for 30 minutes with 5.5 L of demineralized water. The resultant colloidal dispersion contained 200 g/L of cerium oxide. The colloidal dispersion has a density of 1.15 g/ml and a pH of 1.8. 0.30 kg of a zeolite powder (Zeolyst™ CBV 720 obtained from Zeolyst International; pH 3 to 5) was added with stirring to 1.0 L of the cerium oxide colloidal dispersion. The thixotropic mixture (density 1.27 g/ml, pH 3.1) containing a nominal 44% by weight cerium oxide (based on the total equivalent cerium oxide and zeolite content) and 56% by weight zeolite (based on the total equivalent cerium oxide and zeolite content) was spray dried (an inlet temperature of 18O0C and an outlet temperature of 1050C) to yield a free flowing gel powder. About 0.22% by weight of palladium was also added to the treatment composition, which is based on the weight of the treatment composition. The treatment composition was introduced to a paper furnish as a slurry. The treatment composition in the furnish was stirred to form a slurry. The slurry was transferred in the conventional paper making manner and was laid as a layer on a moving conveyor to form the resultant incorporated cigarette paper. Once the paper was prepared, the paper was coated with calcium carbonate to improve the colour of the paper and to improve the ash. The cigarette sample itself was then prepared using the incorporated cigarette paper/wrapper and the same components (e.g. filter and tobacco blend) and manufacturing process as for the cigarette sample 101. The following results are based on quantitative analyses performed in accordance with official methodologies prescribed by Health Canada. Table 1 shows the analysis of cigarette samples 101, 102 and 103 as compared to cigarette sample 100 (control) for certain constituents of mainstream smoke and other properties of the cigarettes. When comparing the cigarette samples to the cigarette sample control, the numbers provided show the percentage of the control. For example, if there is 8.7 mg of tar in the mainstream smoke of the control and the tar in the mainstream smoke of the cigarette sample 101 is 103% of the tar in the control, the tar produced from cigarette sample 101 is 9.0 mg. Compared to the control, the tobacco smoke coaxial filter and/or 100% lamina cigarettes showed a reduction in carbon monoxide and carbonyls in mainstream smoke. In addition, the combination of a sidestream smoke cigarette, the tobacco smoke coaxial filter and 100% lamina showed a similar reduction in the constituents of mainstream smoke. Although certain embodiments of the invention have been described herein in detail, it will be understood by those skilled in the art that variations may be made thereto without departing from the spirit of the invention or the scope of the appended claims. 1. A cigarette for reducing a ratio of at least one constituent to tar in mainstream smoke, the cigarette comprising at least one of a low efficiency tobacco smoke filter and a tobacco blend having a lower stem content as compared to a conventional tobacco wherein the cigarette is at least one of a sidestream smoke treatment cigarette and a low ignition propensity cigarette. 2. The cigarette of claim 1, wherein the cigarette is a sidestream smoke treatment cigarette comprising a tobacco rod, a treatment wrapper/paper and a low efficiency tobacco smoke filter, the treatment wrapper/paper comprising a sidestream smoke treatment composition, wherein the treatment composition comprises in combination, an oxygen storage and donor metal oxide oxidation catalyst and an essentially non-combustible finely divided porous particulate adjunct for the catalyst. 3. The cigarette of claim 2, wherein the cigarette is a low ignition propensity cigarette. 4. A cigarette of claim 2 or 3, wherein said catalyst has an average particle size of less than about lμm. 5. A cigarette of any one of claims 2 to 4, wherein said adjunct is a high surface area porous material with a surface area in excess of about 20 m2/g. 6. A cigarette of claim 5, wherein said adjunct is selected from the group consisting of clays, essentially non-combustible milled fibres, monolithic mineral based materials, essentially non-combustible activated carbon, zeolites and mixtures thereof. 7. A cigarette of claim 6, wherein said adjunct is a zeolite. 8. A cigarette of any one of claims 2 to 7, wherein said catalyst is selected from the group consisting of a transition metal oxide selected from the group consisting of group VB, VIB, VIIB, VIII, IB metal oxides and mixtures thereof; a rare earth metal oxide and mixtures thereof; and a mixture of said transition metal oxide and said rare earth metal oxide. 9. A cigarette of any one of claims 2 to 7, wherein said catalyst is a mixture of a rare earth metal oxide and a transition metal oxide, said transition metal oxide being selected from the group consisting of group IVB, VB, VIB, VIIB, VIII, IB metal oxides and mixtures thereof. 10. A cigarette of any one of claims 2 to 7, wherein said catalyst is selected from the group consisting of a transition metal oxide selected from the group consisting of group VIIB and VIII metal oxides and mixtures thereof; a rare earth metal oxide and mixtures thereof; and a mixture of said transition metal oxide and said rare earth metal oxide. 11. A cigarette of any one of claims 2 to 10, wherein said catalyst is a precursor of said catalyst. 12. A cigarette of any one of claims 2 to 11, wherein said catalyst is on and/or within the adjunct. 13. The cigarette of any one of claims 2 to 12, wherein the oxygen storage arid donor metal oxide oxidation catalyst is ceria and the adjunct is a zeolite. 14. The cigarette of claim 1, wherein the low ignition propensity cigarette comprises a porosity reducing composition. 15. The cigarette of claim 14, wherein the porosity reducing composition is an alginate. 16. The cigarette of any one of claims 1, 14 or 15, wherein the sidestream smoke treatment cigarette comprises a sidestream smoke treatment composition in at least one of the filter, the tobacco and the cigarette wrapper/paper. 17. The cigarette of any one of claims 1 to 16, wherein the cigarette comprises the low efficiency tobacco smoke filter and the tobacco blend. 18. A cigarette for reducing a ratio of at least one constituent to tar in mainstream smoke, the cigarette comprising a synergistic combination of a low efficiency tobacco smoke filter and a tobacco blend having a lower stem content as compared to a conventional tobacco. 19. The cigarette of any one of claims 1 to 18, wherein the filter is less than about 50% efficient. 20. The cigarette of claim 19, wherein the filter is less than about 40% efficient. 21. The cigarette of any one of claims 1 to 20, wherein the low efficiency tobacco smoke filter comprises an adsorbent. 22. The cigarette of any one of claims 1 to 21, wherein the tobacco blend comprises an amount of stem from about 0 weight % to about 20 weight % of the total weight of the tobacco blend. 23. The cigarette of claim 22, wherein the tobacco blend comprises an amount of stem of about 0 weight % of the total weight of the tobacco blend. 24. The cigarette of any one of claims 1 to 23, wherein the low efficiency tobacco smoke filter is a tobacco smoke coaxial core filter. 25. The cigarette of claim 24, wherein the tobacco smoke coaxial core filter comprises a filtering material forming a layer around a less dense filtering material core, the filter further comprising a ventilated tipping paper. 26. The cigarette of claim 25, wherein the less dense filtering material core comprises conventional material of low filtering efficiency. 27. The cigarette of claim 26, wherein the conventional material of low filtering efficiency is cellulose acetate tow or other fibre of 8 dpf or more. 28. The cigarette of claim 25, wherein the filtering material comprises cellulose acetate tow less than 8 dpf. 29. The cigarette of claim 25, wherein the filter further comprises one of a wrap, sleeve and integral skin around the core. 30. The cigarette of claim 25, wherein the filter comprises adjacent cores. 31. The cigarette of claim 25, wherein the ventilated tipping paper provides about 10% to 90% air dilution of the smoke. 32. The cigarette of claim 30, wherein the ventilated tipping paper provides about 35% to about 50% air dilution of the smoke. 33. The cigarette of any one of claims 1 to 32, wherein the filter has the properties of a low efficiency tobacco smoke filter having a range of ventilation. 34. The cigarette of any one of claims 1 to 33, wherein said at least one constituent is carbon monoxide and/or a carbonyl selected from the group consisting of formaldehyde, acetaldehyde, acetone, acrolein, propionaldehyde, crotonaldehyde, butyraldehyde, and methyl ethyl ketone. 35. A method for reducing a ratio of at least one constituent to tar in mainstream smoke from a burning cigarette comprising using a cigarette comprising at least one of a low efficiency tobacco smoke filter and a tobacco blend having a lower stem content as compared to a conventional tobacco, wherein the cigarette is a sidestream smoke treatment cigarette and/or a low ignition propensity cigarette. 36. A method for reducing a ratio of at least one constituent to tar in mainstream smoke from a burning cigarette comprising using a cigarette comprising a synergistic combination of a low efficiency tobacco smoke filter and a tobacco blend having a lower stem content as compared to a conventional tobacco. 37. The method of claim 35 or 36, the low efficiency tobacco smoke filter is a tobacco smoke coaxial core filter. 38. The method of claim 37, wherein the tobacco smoke coaxial core filter comprises a filtering material forming a layer around a less dense filtering material core, the filter further comprising a ventilated tipping paper. 39. The method of any one of claims 35 to 38, wherein the tobacco blend comprises an amount of stem from about 0 weight % to about 20 weight % of the total weight of the tobacco blend. 40. The method of claim 39, wherein the tobacco blend comprises an amount of stem of about 0 weight % of the total weight of the tobacco blend. 41. The method of any one of claims 35 to 39, wherein said at least one constituent is carbon monoxide and/or a carbonyl selected from the group consisting of formaldehyde, acetaldehyde, acetone, acrolein, propionaldehyde, crotonaldehyde, butyraldehyde, and methyl ethyl ketone. 42. A cigarette for reducing a ratio of at least one constituent to tar in mainstream smoke, the cigarette comprising at least one of a low efficiency tobacco smoke filter and a tobacco blend having a lower stem content as compared to a conventional tobacco, in combination with at least one of a cigarette wrapper/paper, tobacco additive and tobacco smoke filter additive. 43. The cigarette of claim 42, wherein said at least one of the cigarette wrapper/paper, tobacco additive and tobacco smoke filter additive that reduces the amount of at least one constituent in mainstream smoke and sidestream smoke. 44. The cigarette of claim 42 or 43, wherein at least one of the cigarette wrapper/paper, tobacco additive and the tobacco smoke filter additive comprises at least one metal oxide. 45. The cigarette of claim 42 or 43, wherein at least one of the cigarette wrapper/paper, tobacco additive and the tobacco smoke filter additive comprises at least one metal oxide and at least one adjunct.